The maypole wrought iron classic bird cage eight-light chandelier, finished in matt black, with metal candle pans and matching candle tubes. 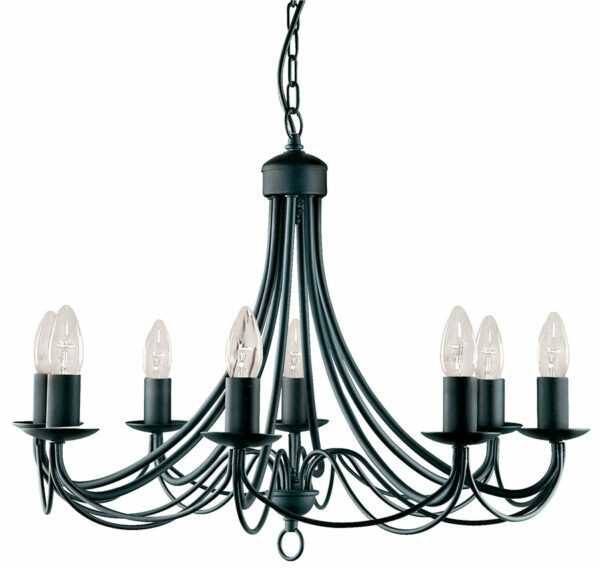 The eight candle holders are mounted on long curved arms suspended from a matt black ceiling plate and the rich, layering effect creates a look that is both elegant and modern. Suitable for your living room, bedroom, hallway or dining area. Part of the Maypole range of traditional wrought iron lighting. Height adjustable, maximum drop 101 cm. Hello Gwen and thank you for your question. The Maypole range does not include a twelve light. The eight light is the largest in the range.